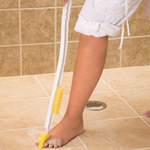 …figure-8 antimicrobial sponge gently cleans hard-to-reach areas without bending or straining. 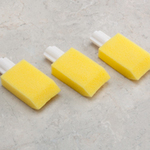 Shower sponge helps eliminate bacteria and odors for long-lasting freshness. * Perfect for those with limited mobility. * Lightweight, 22"L ergonomic handle. * Thick 5" x 2" antimicrobial bath sponge. …reach to gently clean your back, legs, feet and more without bending or straining. Antimicrobial bath sponge helps eliminate bacteria and odors for long-lasting freshness. * Perfect for those with limited mobility. * Lightweight, 22"L ergonomic handle. * Thick 5"dia. antimicrobial shower sponge. Long handled foot brush refill fits our long reach foot brush, which enables you to cleanse your feet without stooping or bending. Brush refill is great for cleaning or applying lotions or medicines.